The HRD Department is offering short-term and long-term courses for upgrading the English language skills of the public, the government staff in particular. Occasionally, the department offers English courses for other ministries and also provides translators, interpreters, masters of ceremonies, liaison officers for international meetings, forums and conferences. The ICT and Resource Department assists teachers and students to be able to operate machines and equipment well, trains teachers to be able to effectively used ICT in language teaching. The department is now setting up a systematic library system and collecting e-learning resources. The department is also responsible for compiling and distributing audio and video materials, and powerpoints on lectures, seminars and conferences. The Curriculum and Materials Development Department keeps the record of all the teaching materials at the basic education level and the tertiary level and records the changes made in curricula and syllabuses of both the basic and higher education levels. The department is also responsible for organizing the workshops, seminars and ELT conferences and publishing the proceedings of the conferences. It also reviews and revises the English curricula used in international education arena and provides suggestions to the English Board of Studies for updating the teaching materials. The Training Department is responsible for conducting different kinds of ELT related courses like courses for upgrading the newly appointed tutors and demonstrators from the Department of Higher Education, Refresher Courses for faculty members, and Language Teaching Methodology Courses for teachers from basic as well as higher education levels; Courses on Teaching English Using ICT and Cascade courses. It also organizes seminars, workshops and talks by inviting local as well as international ELT experts and teacher trainers to promote the capacity of the faculty. The Department also carries out on-demand courses like Presentation and Public Speaking Skills, Masters of Ceremonies, English for Secretaries. 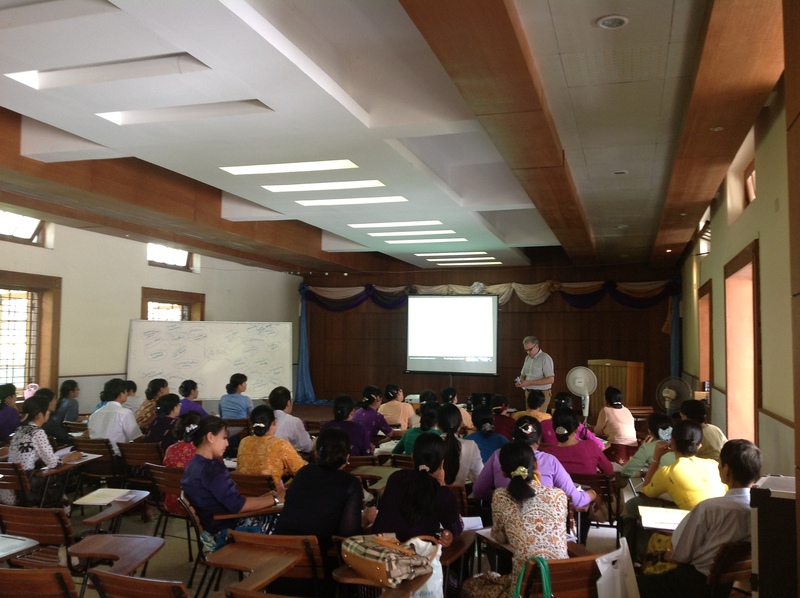 The Assessment and Research Department is responsible for exploring the trends of international assessment systems and developing an assessment system that can really assess the English language competency of learners through research and conducting research for effective teaching and learning of English in Myanmar. Established on 23 December 2004 under the Department of Higher Education, Ministry of Education, Myanmar housed at Pang Long Hall, located on Yangon University Campus, next to Judson Church. © 2017 Copyright by NCEL. All rights reserved. Designed by World Wide Myanmar.